You might be surprised to know that if your house build is anywhere near Passivhaus standards then minimal heat demand makes underfloor heating a waste of time and money. Well, that’s a big saving so bring it on but what to do instead? Underfloor heating did away with horrible radiators, and we don’t want them back, so that just leaves warm air blowers such as kickplate heaters – i.e. water powered puffer heaters. On the walls without plaster theme here I proposed a kickplate heater, in the lower cupboard part, to give an occasional guff of hot air and for slightly under £200 you can do just that. However these neat little units aren’t perfect. They have to shift a lot of air through a small aperture so they are intrinsically noisy, draughty and the heat exchanger, or a filter, can clog with dust and pet hair fairly quickly. Larger versions are available but they aren’t so neat and they are much more expensive. So here’s the Original Twist alternative which is cheaper, quieter and more reliable. 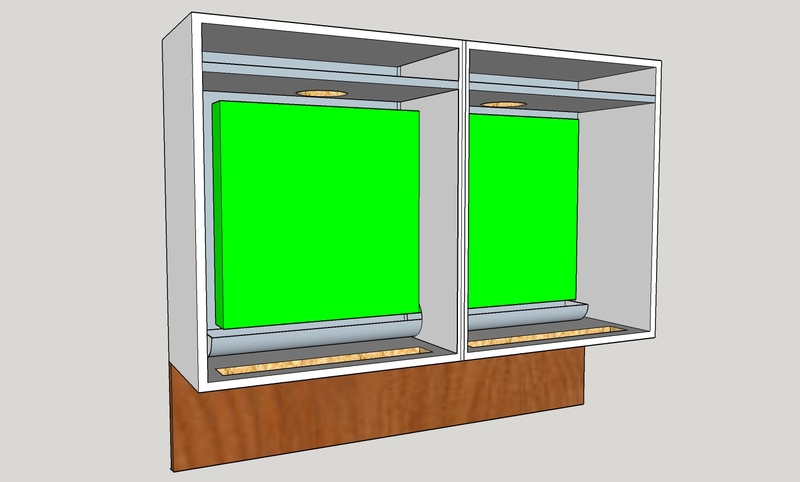 Lets assume that the low cupboard bit of your wall is made of typical 720mm x 300mm kitchen carcass units. A pair of them 600mm wide with a large slot cut out of the inner sides allows a 1000mm x 500mm x 70mm double radiator to fit inside (£48.14 Screwfix). Each of the top shelves is fitted just low enough to mount a 140mm fan from a computer (£10 – 20 Amazon etc) and these gently blow air past the radiator and out of the bottom. You can decide where the air inlet goes: probably top front but a wall panel channeling much warmer air from ceiling height is worth a thought. This unit also does air conditioning when paired with a suitable heat pump hence the length of plastic guttering under the radiator to catch any condensation. N.B. The Renewable Heat Incentive does not support heat pumps with integrated aircon but you can still get it if you use a separate chiller unit. You might want to kill airborne pathogens. There is plenty of space in the box for a pair of UV lamps but if you do fit them then avoid or wrap PEX water pipes because UV will kill them too. Fitting UV tubes in the top sections with the fans underneath is the way to go. Controls: The fans are switched on automatically when either hot or chilled water arrives at the radiator. An ESCO solar controller does all that for £45.50 or about half that with a frost stat and a 2 pole thermostat. You’ll also need a variable resistor for speed control. The fans are 12v so you’ll need a power supply and, like the fans, these are cheap PC components. Remember that the LED strip lights in your integrated beam floor could be 12V and might like to share that power supply. And that’s it really. A few simple components all easily obtained and making the perfect, reliable fan-coil unit. When turned down to essentially silent the fan pair will move about 100cfm and the heat output will be between 1 and 2kW depending on the water supply temperature. You might wonder why all this effort gives you anything better than the radiator fitted as normal. The answer is that heat pumps don’t work efficiently at the 60c normally used with radiators. While under-floor heating is the best at low temperatures a fan-coil unit works reasonably well at 40c. The only reason our unit has a radiator is that with all the fins in a double radiator you get a high surface area for not much money. The heat delivery couldn’t be more different. A radiator wafts hot air straight up to the ceiling where it tends to remain – with replacement air moving across the floor as a cold draught. A fan-coil on the other hand, blows warm air across the floor where it mixes with cooler air in the room and gives a faster and more comfortable heating experience. 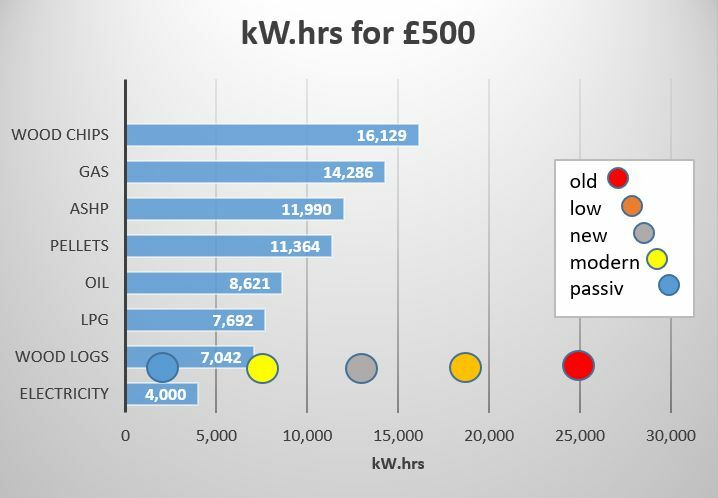 Have a look at this chart on heating costs for various house types to appreciate why a Passivhaus with a small heat pump and some fan-coil units could be the way to go. You’ll see that the ASHP can meet the Passivhaus demand for almost no cost. Indeed if the ASHP is connected to PV panels then the running cost of the house will be close to zero if not better. I guess you might be in a state of shock now. Thousands saved on your heating strategy, the government is going to buy you a heat pump and air-conditioning can be a simple addition. For more money saving shocks check out more building ideas on LIST OF POSTS.